"Dämmung, Alu-Butyl, selbstklebend, 18″ x 32″, 9 Platten"
Kit contains nine 18″ x 32″ pieces of Dynamat Xtreme for rear decks, doors, floors and trunk floors. Quantity: Sold as a set of 9. 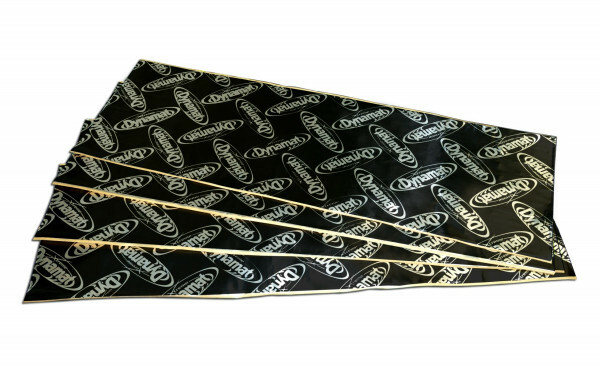 Dynamic Control Dynamat Xtreme sound-deadening liners have the highest damping efficiency. The aluminum outer facing doubles as a radiant energy reflector. These Xtreme liners can be used on any surface, including the firewall, floor, engine compartment, roof, trunk, or doors. They do not require a heat gun for installation.